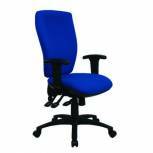 JeminiOuse Fabric Executive Chairs KF50179 Pack of 1 Quality chair with a distinctive design that features a drop back styling, deep foam seat and back rest, adjustable tension control, gas lift height adjustment and a sturdy 5-star base with castors. Colour - Claret. Non returnable. Jemini Hudson Leather Look Chair CH0768 Pack of 1 Jemini Leather Look Executive Armchair. Recommended usage time 8 hours, maximum sitter weight 18 stones. 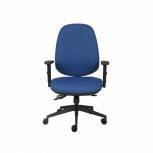 Dimensions - Seat W515xD550mm, Back W550xH675mm, Seat Height 450-550mm. Colour - Black. Non returnable. 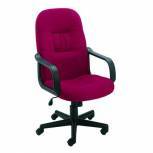 Cappela Rise High Back Posture Chairs KF03494 Pack of 1 High back gas lift chair with deep upholstered curved backrest with lumbar support, double curved waterfall seat with seat slide, heavy duty tensionable mechanism supplied with height adjustable arms. Blue. Non returnable. 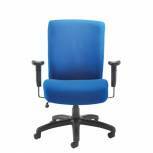 Cappela Rise High Back Posture Chairs KF03496 Pack of 1 High back gas lift chair with deep upholstered curved backrest with lumbar support, double curved waterfall seat with seat slide, heavy duty tensionable mechanism and supplied with height adjustable arms. Black. Non returnable. 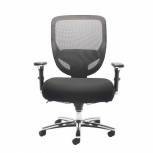 Cappela Aspire and Energy High Back Posture Chairs KF03497 Pack of 1 High back gas lift chair with deep upholstered tri-curved backrest with lumbar support. Blue. Non returnable. 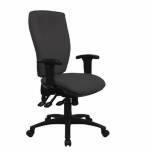 Cappela Aspire and Energy High Back Posture Chairs KF03499 Pack of 1 High back gas lift chair with deep upholstered tri-curved backrest with lumbar support. Black. Non returnable. 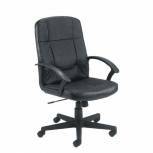 Cappela Aspire and Energy High Back Posture Chairs ACT9/ADJ1/SL/IL Pack of 1 Deluxe High back gas lift chair with deep upholstered square backrest with lumbar support. Blue. Non returnable. 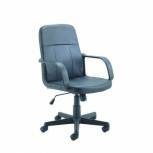 Cappela Aspire and Energy High Back Posture Chairs ACT9/ADJ1/SL/IL Pack of 1 Deluxe High back gas lift chair with deep upholstered square backrest with lumbar support. Black. Non returnable. 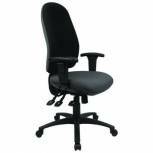 Avior Lomond Heavy Duty Chair Black KF79133 Pack of 1 The Avior Lomond heavy duty chair in Black has extra deep cushioning and upholstery for exceptional comfort. 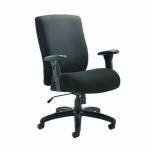 Featuring adjustable arms, the Lomond chair has a recommended usage time of up to 24 hours. The dimensions are: seat W550 x D470mm, back W490 x H600mm and Seat height 530-620mm. 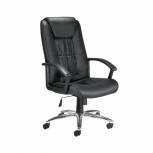 Avior Tuscany Executive Leather Chair CH0240BK Pack of 1 Leather Executive Manager Chair. Max sitter weight 18 stone. Knee tilt. Recommended user time 8 hours. Seat: W550 x D520mm. Back: W550 x H750mm. Seat height: 530 - 600mm. Colour: Black. Non returnable. 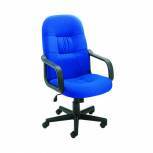 Avior Veloce Leather Look and Mesh Chair KF74495 Pack of 1 Managers chair with a recommended usage time of 8 hours and maximum sitter weight of 18 stone. Ratchet back height adjustment. Seat height adjustment. 3D adjustable arms. 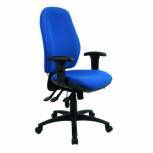 Seat height: 480 - 540mm. 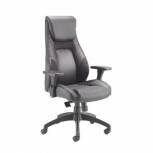 Dimensions: Seat: W530 - D470mm, Back: W490 x H730mm. 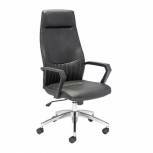 Jemini Ouse Fabric Executive Chairs KF50180 Pack of 1 Quality chair with a distinctive design that features a drop back styling, deep foam seat and back rest, adjustable tension control, gas lift height adjustment and a sturdy 5-star base with castors. Colour - Blue. Non returnable. 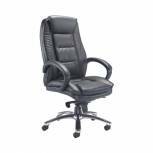 Jemini Thames Leather Look Chair KF50189 Pack of 1 Comfortable leather look chair with arms and expertly matched vinyl trim to the back and arms. Lock tilt mechanism and sturdy 5-star castor base. Non returnable. 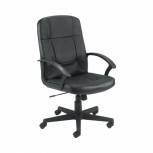 Jemini Trent Leather Look Chair KF73635 Pack of 1 Jemini Trent Leather Look Chair Black KF73635. Recommended usage time 5 hours. Seat dimensions: W440 x D640mm. Back dimensions: W440 x H550mm. 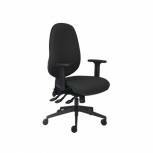 Seat height: 440-550mm. Non returnable. 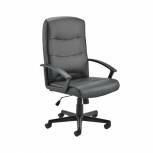 Jemini Tiber Leather Chair KF74003 Pack of 1 Executive Chair. Recommended for up to 8 hours use. Leather covering. Seat height - 465mm-565mm. Fixed Arms. Black five star base (image shows optional chrome base - available separately). Locking tilt mechanism. Colour - Black. Non returnable.